Men in Black was a pretty so-so series. It was pretty damn campy, but for some reason I love them and have hoped for a third film in the series. Well it looks like I am not the only one! It seems under the right circumstances both Tommy Lee Jones and Will Smith would be willing to put back on the black suits! Let's hope the third film will be much stronger than the second Men in Black, which while I still enjoy it, it was nowhere near the quality of the first film. Clearly Will Smith doesn't feel the same as Tim Robbins, which is fine by me. Totally off topic, but do we need a Bob Roberts, Bull Durham, or Shawshank Redemption 2? No, Robbins has always lent himself to films that are not sequelizing material! 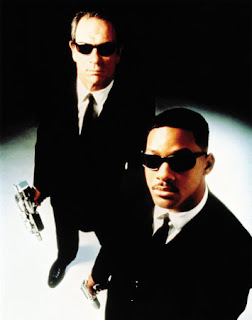 Smith however does and while I hate the idea of an I Am Legend prequel, one more Men in Black sounds like alot of fun! Let's be serious, there are plenty of odd phenomenon out there to come up with a great script for the third film. Just pick up an Enquirer which is the real news in Men in Black world. Thoughts on another Men in Black. Are you game for one more go-round? How old does Rip Torn look now? Can he still pull off the role of Zed?